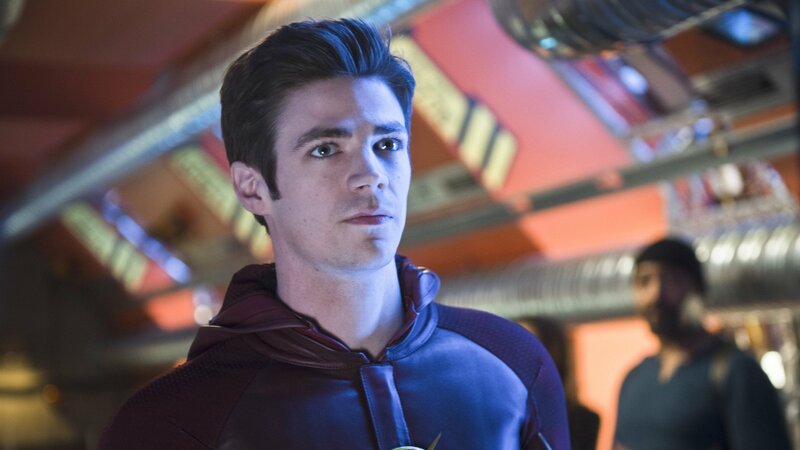 The episode opens in a very dramatic fashion, the usual opening monologue by Barry Allen can be heard, however this version is spoken by Grant Gustin in a much more quiet and tense way. This narration, reiterating Barry’s story to the audience once again is played over shots of the inside of STAR Labs. The whole team is present with the addition of Dr. Martin Stein and Ronnie Raymond, everyone looks very grave as Barry makes his way to the particle accelerator. 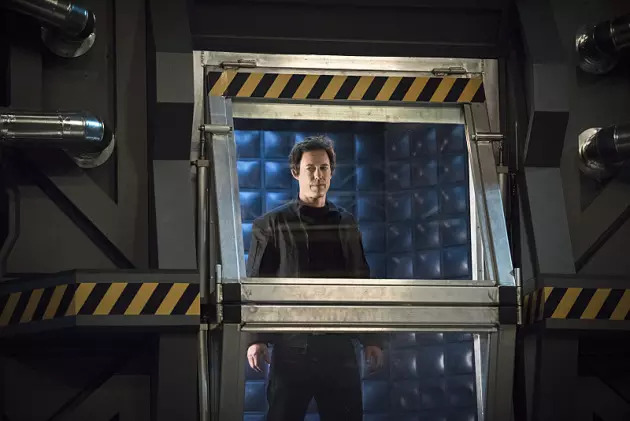 The gargantuan doors open and there, locked in one of the pods is Eobard Thawne. It is clear from this introduction that this is going to be one dark episode. The writing in the initial exchange between Barry and Eobard was fantastic. This scene is what we have been waiting for all season. An open and frank discussion between our hero and the villain of the peace, no masks just the raw facts. The writers hit the viewer with a scene of explanations and plot carried off brilliantly by the brilliant Tom Cavanagh and an effortlessly sympathetic underdog in Grant Gustin. The gloves were off in this scene, there were no pretences, everything was laid out to the viewer, all cards on the table. 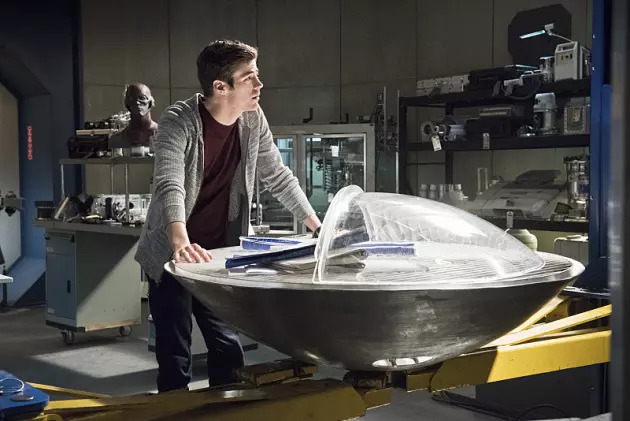 The scene in the prison between Barry and his father was really interesting, it was good to get a different view on the plan of Barry going back in time. These scenes are always really well acted and quite emotional. The scenes between Barry and Iris can be a bit soppy and annoying at times but the one on the rooftop in this episode was actually really compelling. Things got very exciting when Thawne went over exactly how Allen would travel back to the past and he to the future. There was no action in this episode for quite some time and yet it was absolutely gripping. This being because a great storyline came to boiling point in a well written masterpiece. The soundtrack to The Flash is fantastic, I hope they release an album of the score. The goodbyes that happened before The Flash went off to save the past were quite emotional. The exchange between Barry and Joe West was especially emotional. Barry finally accessing the Speed Force was an electric moment. Another of the pivotal moments for the character and the series. The moment Barry reappeared back in the house was tense, it led to a heartbreaking twist. However, the moment that followed was bitter-sweet. The acting in this scene has to be commended. The helmet that appeared as Wells was about to board his ship belongs to an alternative version of The Flash, that is a huge development. Barry hitting a super sonic punch through Well’s ship straight out of the wormhole was badass. The fight scene that ensued was fast paced and brutal with a lot of drama and emotion to go with it. I was blind sided by the twist in this scene when Eddie shot himself to prevent Thawne from ever existing. I honestly didn’t expect Reverse Flash to die this early in a TV series about this character although I suppose you can never know with a show like this, he can always come back. There was a sadness to the music and the images of everything being pulled into the wormhole including Eddie’s lifeless body. Buildings splitting apart as Barry jumps between pieces of debris making his way to the black hole that is tearing his city apart, what an incredible piece of television. The effects in this scene were amazing. This finale was a departure from the typically light and fun episodes. But the darker and more serious tone was welcome. It brought together all of the best elements of the show in one epic episode, I can’t wait for season 2.